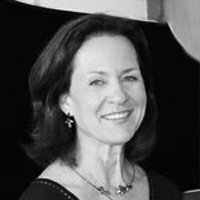 Pianist Lynne Mackey is an active performer of solo, chamber and concerto works. Career highlights include performances at Weill Recital Hall in New York City, the Banff Centre in Alberta, Canada, and in Brazil, Spain, Morocco and the Netherlands. Ms. Mackey was awarded a residency in Paris at the Cite Internationale des Arts, for research and performance involving piano and harpsichord projects. In addition to holding a Doctorate from the Eastman School of Music, she holds a Masters degree from The Juilliard School, and a Bachelors degree from the University of Michigan. Winner of both the William C. Byrd and the Grand Rapids Symphony concerto competitions, she has appeared as guest soloist with the Grand Rapids and Flint Symphony in Michigan, and with several orchestras in Virginia, including the Lynchburg Symphony. As harpsichordist, activities include a guest appearance as harpsichord concerto soloist with the Presbyterian College Chamber orchestra in South Carolina. She was also invited to perform in a week of solo master classes conducted by the distinguished harpsichordist Trevor Pinnock. She is currently Director of the Virginia Baroque Performance Academy. Ms. Mackey was the first performing artist to be awarded an Appalachian College Association Fellowship, for a one-year residency at the University of Virginia in the field of contemporary music. She has given lecture recitals in many venues, including the Hawaii International Conference on Arts and Humanities. Ms. Mackey currently teaches at Mary Baldwin University, and has taught on the faculty of several colleges and universities including Eastern Mennonite University, the University of Mary Washington, the University of Virginia, and Bluefield College, where she also held the position of department chair.